When it comes to marketing, a massive 94% of businesses will tell you that personalisation is vital to their strategy. However, only 72% of marketers know how to successfully implement a personalised marketing strategy. In the age of the connected consumer, most marketers focus their personalisation efforts online due to the relative ease associated with it. However, opportunities are being missed by excluding offline personalisation in delivering a multi channel marketing campaign. With the variety of communication and social platforms available, brands have to work harder in getting their message across. Although online personalisation is a cheaper and time saving option, it doesn’t have the same impact as offline marketing. The importance of personalisation comes from the customers need to be shown that you understand their preferences and their lifestyle. Brands need to be able to talk about individual products and services that may be of interest. When customers like what you have to offer, they are more likely to keep your company on their radars. Relevant and personalised communications across multiple channels can deliver a 20-30% increase in ROI! One of the key factors affecting the success of personalisation is the used to understand your customers behaviours and habits. The more detailed information you hold on your customers, the easier it is to personalise your marketing materials. Collecting data on demographics, preferences, past behaviours and real-time behaviours all help build up a well-rounded picture of the customer as an individual. Customer data can be gathered through social media profiling tools, customer service interactions, internet searches and transactional data to name but a few. It’s not sufficient enough just having the data though; it’s what you do with it that will impact the success of a campaign. Whether you are sending out personalised marketing by name, location, past transactions, interests or a combination of these, it’s vital to ensure the data you have is correct and up-to-date. There is nothing more frustrating for the customer than receiving personalised marketing with the wrong information. Ensuring your customer data is clean and correct will instil confidence in the customer. It also increases the chances of them responding to your marketing efforts. 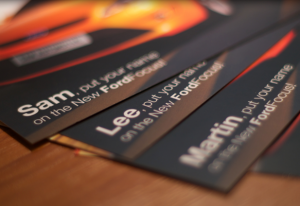 With the introduction of digital print technologies, the production of relevant and responsive direct mail has now been made easier. The process has become flexible enough that it allows businesses to customise anything from a single line of text to an entirely different piece for each customer or prospect. In a recent survey from the Royal Mail, it was established that it is now 25% less expensive to implement a digitally printed communications than it was 5 years ago. Personalised campaigns can be rolled out across a number of channels, giving you the opportunity to speak to your customers through their preferred channel. Customers increasingly expect to have a personalised experience when they engage with a brand. The is no secret formula to success with personalised marketing but having a clear understanding of your audience is a great starting point. At Burst Digital we believe that combining print media with smart technology creates better campaigns. We house some of the latest digital printing technology that will allow you to produce dynamic, personalised direct mail that will open up channels to your customers and prospects. In short, it can mean more conversions, more enquiries and more sales.